Hatsumode is a Japanese tradition of visiting a shrine or temple for the first time at the start of a new year. Hatsumode is a very important custom for Japanese people because it gives them a chance to pray for happiness in the upcoming year with their family members. People pray for the sake of their health, studies, pregnancies, traffic safety, love, and various other things. For this reason, many people go to the shrine on New Years Day, so it is always very crowded at that time. At larger, more popular shrines, vendors of different types also put up stands on the shrine grounds or even outside the shrine. The whole atmosphere is like that of a festival. Originally hatsumode was called toshikomori, and was a time for people to stay in their houses from the night of December 31st to morning of January 1st. This custom was meant to give people happiness by giving them a chance to meet Toshikamisama, or the God of the New Year. Toshikomori changed to hatsumode about 100 years ago, during the middle of the Meiji period. Many years ago, there was little in the way of transportation, so people could not so easily get to a shrine. These days, however, trains run almost non-stop, so people can easily get to the shrine and pray for happiness. There are three main customs related to hatsumode that all Japanese people carry out during their New Years visit to the shrine: washing hands, praying to the gods, and drawing a fortune slip. 6. Rinse the ladle using the excess water. To do this, tilt the ladle upwards until the water pours out from the scoop and over the shaft. 1. Grab the rope and ring the bell. This is to wake up the god of the shrine. 2. Toss a coin into the saisenbako. Five yen coins are commonly used for this. 3. Bow to the shrine twice. 4. Clap hands twice in front of the saisenbako. 6. Bow once, and then walk away from the saisenbako. In addition to praying to the gods, visitors also draw a fortune slip, called omikuji. These can be purchased at the shrine, often for around one hundred yen. Each omikuji represents different levels of luck for the year: very good luck, good luck, OK luck, bad luck, extremely bad luck and so on. Omikuji also tells you your fortune in specific areas of your life, such as health, romance, money, and education. After reading the fortune, most people hold onto it. There are many shrines for hatsumode in Kyoto. Each one has a unique series of gods and spirits representing different energies. Located in Kamigyouku, Kitano-Tenmangu shrine is famous for the god of studies. Therefore, many students go there to pray. However, not everyone prays for their studies; some people go there to pray for their good health or other purposes. 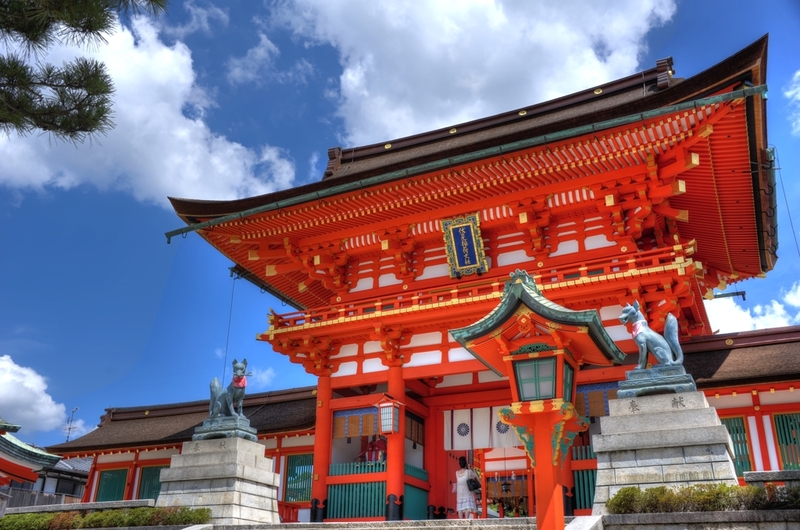 Fushimi Inari Taisha Shrine is one of the most famous shrines in Japan, and is in Fushimiku. This shrine is dedicated to the god of business, so if you are one of the many businesspeople visiting Japan, we recommend that you go there. Fushimi Inari Shrine has some famous structures. There are the hundreds of torii, or tall red gates, to walk through, each donated by a different Japanese business. The building made from hinoki, or Japanese cypress trees, is the main shrine and is an important cultural property. It was refurbished in 1499. Also, there is a tower gate painted in red, which was made by the contribution of Hideyoshi Toyotomi in 1589. Hideyoshi Toyotomi was a famous Japanese politician who helped to unify Japan during the Sengoku period. There are two events at Fushimi Inari Shrine for New Year’s Holiday on December 31st and January 1st. December 31st is when the Oharae ceremony is held. It is an event that cleanses people of the sins they committed in the second half of the year, to try to enable them to spend the New Year without impurity. Next is the Saitan festival on January 1st. At the event, people pray for safety and prosperity from the god of Inari Shrine. Heian Jingu is probably the most famous and iconic shrine of Kyoto. It is in Sakyouku. It was built to memorialize the peaceful removal of the Japan’s capital of 1100 years. Kyoto was laid wasted by war at end of Edo period. So this shrine was built by enthusiasm of Kyoto’s citizens. It is one of the main locations of the famous Jidai Matsuri, which is held in October each year. There is also a Japanese garden and a shrine garden around the main shrine. The total area of the gardens is about 30,000 square meters. Cherry blossoms and irises bloom there during certain times of the year. Heian Jingu is dedicated to the emperors Kanmu and Koumei. Praying there is supposed to improve your fortune. During hatsumode, many people pray for business prosperity, good luck, sending away evil spirits, matchmaking, and the success in school. New Year’s ceremony is held on January 1st, at 6 o’clock. This shrine is one of the oldest shrines in Kyoto, and also in Sakyouku. It contains two shrines within: the East and West shrines. Each shrine has its own separate god, the two of them being husband and wife. Shimogamo Jinja is also known for its magnificent cherry blossoms, autumn leaves, and its fresh greenery. The famous Aoi Matsuri festival is held at Shimogamo Jinja each year on May 15th. At Hatsumode, many people come to pray at this shrine for good luck in marriage and having kids. As you can see, there are many kinds of shrines in Kyoto. So before you go to Hatsumode, you should choose which shrine is suitable for you. From the last day of the year to the second day of January, Kyoto city buses and the subway remain in business during the night at no additional fee. You can go to Hatsumode as soon as the New Year begins, but at that time the shrines are always very crowded every year. If you don’t want to go when it is crowded, you should try going to a shrine from 3 a.m to 5 a.m., when there are fewer people. Enjoy your New Year’s in Kyoto.